26th November 2008 will be 40th days since daddy left us, time running too fast but I am still trying to recover from torturing myself with all the memories we had as a Child, Daughter, Friends and we laugh a lot than others in the family. How could he left me while I am still 23 years old! Life is like that, maybe, maybe not. Tears start falling by now. I just want to drop some sms which I still keep in my phone. I have two numbers, one is Celcom mainly for business use and another one is Digi for personal use only. Jaq @ besfren – Im sory,.siou gee, sa jaln da pi rmh kmu ni. Aunt BB – Eya kah..sabarlah ah, u must be storing..
James Kupong – Very sorry to hear about your Dad. Kajirin – Hah apapun kamu kena bnykkn bersabar kerana itu adalh ketentuan takdir setiap manusia yg hidup didunia pasti akan menemui ajal,tuhan lebih sygkn dia. Tommy Lankan – Omg! Realy sorry 2 hear it. I’ll tel mom, realy a shocking news. Where? At home? Funeral? Tommy Lankan – Be strong, God loves&needs him more than us here. He’s nw in a peaceful resting place. i knw how it feels loosing someone who is dear n close to us. When funeral? Bryan Clemence – Hah btl ba gee..X sempat p lawat dia,gee sya harap ko sabar ah. Mjj – Ala dui gia…bah kuat kan semagat..
Norzianie – ok.kalo tada halangan kami pigi hari ini.smlm kami myesal jgk tdk p awal2 sedangkan kami d kingfisher beraya..k lah..jaga mummy ko baik2. Norzianie – ya lah..berdoa saja lah yh mampu kita buat skrg smga smuanya berjalan lancar dn smua dlm keadaan baik wlupn tak sbaik yg kita inginkan.terbayang2 sya muka daddy ko tau.sya pun turut menangis.terasa sprti dia dekat d hati smua yg mengenali arwah..sya ckp serius ni.bila pndgng muka daddy ko pun sprti suda tahu dia seorng yg baik.smoga Tuhan merahmati pemergianya. Galangasbaby – Girl….my condolence to u.. May his soul rest in peace.. Be strong.. I’ll pray for u n ur family n also his soul..
Dengkos – Sory to hear bout ur dad, condolence from me. Dear’s Mum – Our deepest condolence 2 u n family k.
Carol Oolmela – Aduii xsngka sa sabar ko k..Nant sa p uma ko sm roy ada jg sa gtau yg len.May his soul rest in peace..Sa pun sedi hmm.Bgs2 ja ko sna k.
Augustine Yong – Vera, sorry to hear the passing of father. My heart felt condolence to you n your family. -august. Antos – Girlly..be strong ok..
Siti Raff – Vera..me n radi feel sori wit ur lost, realy hope u can accepted it well, life goes on..
Vanessa Cuz dear – Girl, sorry to knw abt ur late father..my condolences to u n ur family. Im sorry i cnt attend the funeral. May God bless u n ur family n may ur late father rest in peace. If u nit anything, pls x hesitate to let me knw. Take cre. Fariz – Hi girl..I juz heard d nws..Im sory about it..Sa harap ko bnyk2 sabar ah..N pray to God..God bles..
Daniel Chua – It is not going to be easy. But being eldest, u hv to be strong n be the pillar of strength both to your brothers n mum. All will be fine given time. Michelle – Sis, ive heard about ur father.. Sory to hear sis.. 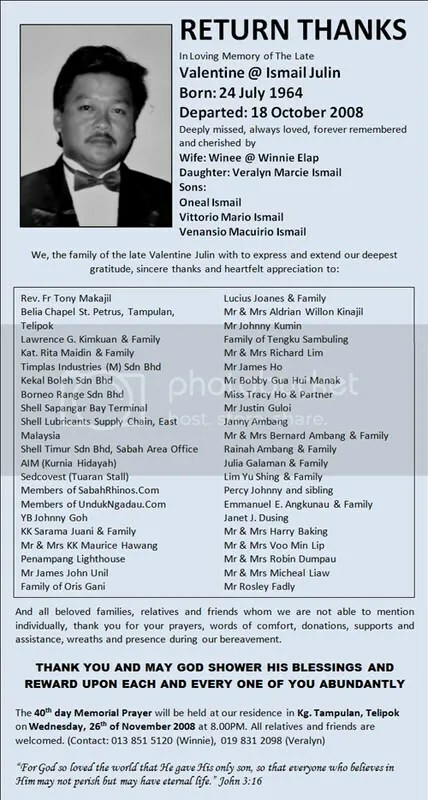 I hope u will b strng… Condolence to u n ur fmily..
Benny Liew – My condolence…b strng…god bless he is safe now..
Fuzz – Huh?. Sorry vera… Takziah. Jan ko sedih aa… Apa jadi mesti ada hikmah. Marilyn – Condolence from my family to your loss…hope that u be strong n just pray..
Syaedatul – Vera i’m sory 2 hear bout ur dad.Y ko x kestau kami?Jan sedih2 ah.I know how u feel.Take care of ur mum n ur brothers.Wish all d best n may god bless u n ur family. Aldrian Kinajil – Deepest condolence from both of us..
Nattelim – Im so sorry… If theres anything i cn do,pls let me knw.i’l pray 4 u n family.may he rest in peace..
William – Moi,bnyk2 besabar, kita terima kenyataan dan bedoa agar roh tenang. Nanti sy blik kk, sy p rmh ko. Nattelim – Let me knw k..im so sory.ur dad is a gr8 man. Rosley Fadly – Kami akan sapot sis smp bila2.Kstau ja if perlu apa2 k..I luv u sis..
Isa – Girl,sy br t’baca d forum..Takziah utk kami sekeluarga.. Semoga tabah..
Antos – Baru tau 2 news d sr.c,girlly napa daddy..huhuhu..takziah ah..
Dear :-* – OMG.. >:D< cudle tite2.. Dear,m sory 2 hear dat.. B strong k..
Harry Wong – I am so sorry to hear that Vera. My condolences to you and your family. Hope you will be strong to face the future. Dear :-* – Sabar k.. >:D< cudle tite2.. I rili wish m deh.. If i jz can make it.. Plz take care of ur health my dear..
Dear :-* – Yes sweetheart..dun wory k..i take cr so i can get well soon..i want 2 cudle u.. >:D< cudle tite2.. Miss u so much.. Condolence 4rm all us here.. The Gracia..
Didie @ Likas – Im so sory 4 lose. Kc kuat iman n byk bsabar. God bless u all. Lo Sze Peng – Sorry for your loss. Yvonne Li – Hey dear!sorry to hear about ur lost.cry out all you need n stay strong now s ur family needs u.take great care. *hugs*Everything’s gonna be alright. Evonne – Hi girl.. Baru saja my mum told me on d phone..bru i want to find u. Im sorry 4 your lost.. I rly dunno coz i went camping 2days, bru blk smlm, I blk my aunt hse here penampang. Sorry girl sya tdk sempat p sana.. Condolence 2u n family..
Antos – Adik pun send condolence regards..td dia call..sy bg tau..
Chong Foo Yung – Hi dear,very sad to hear what hv happen to u.. Hope u wil ok soon, be strong..
Nater – O.. Neway sy mo ucap takziah. Bw bnyk2 bsabar n doa k.
I have received calls and condolences too.. Thanks to all of you who never stop supporting me.. God bless you and your family.. and please take good care of your health and love ones.. Please join us in 40th Memorial Prayer at our residence in Kampung Tampulan, Telipok, 26th November 2008, Wednesday, 8.00 PM. oh dear gal! blm sy baca abis …mcm i can burst to tears ni …. :hug: be strong all the time my dear..
Sebab sya menangis time menaip ba.. pamacam juga..
My condolence to you and your Family…..